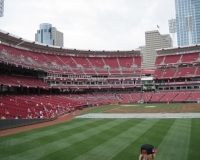 The focus of Cincinnati’s sports scene is its riverfront, as its teams have taken up residence alongside the Ohio River for more than 40 years now. 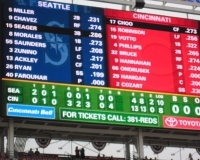 For the Reds, Major League Baseball’s oldest franchise, that has meant plying their trade since 2003 at Great American Ball Park — a modern facility that’s designed to give off an old-timey charm as well. 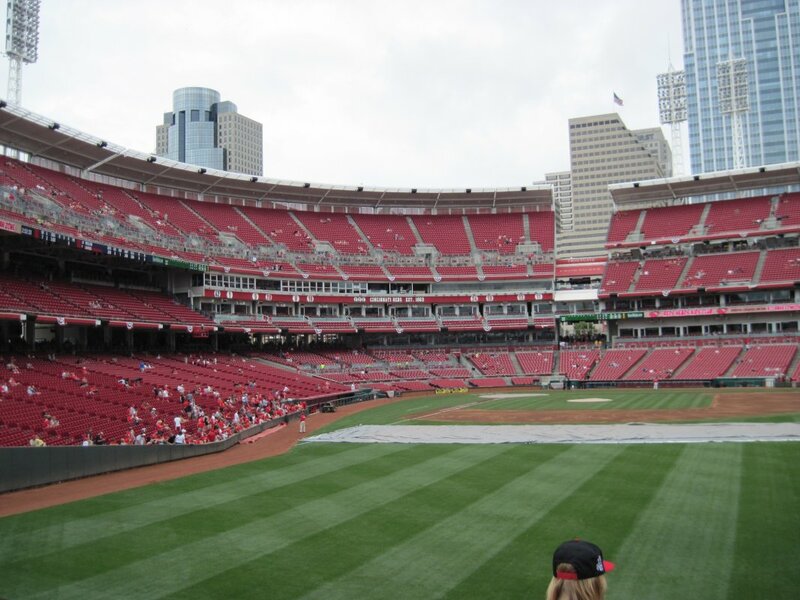 The Reds’ significance in MLB history means they’re always home to begin each season, and Opening Day is one of the days in which Great American Ball Park shines. 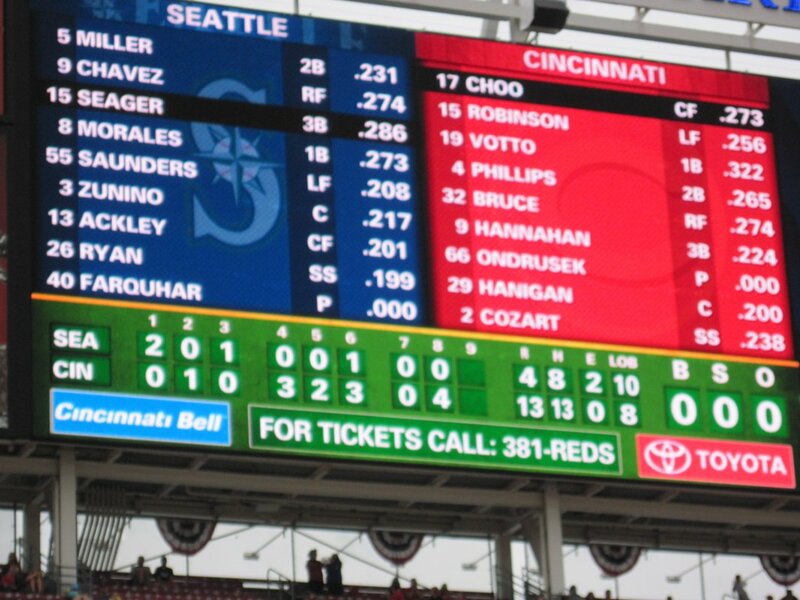 And Cincinnati’s fans can be one of the most boisterous in baseball, especially when the home team is enjoying a strong season. 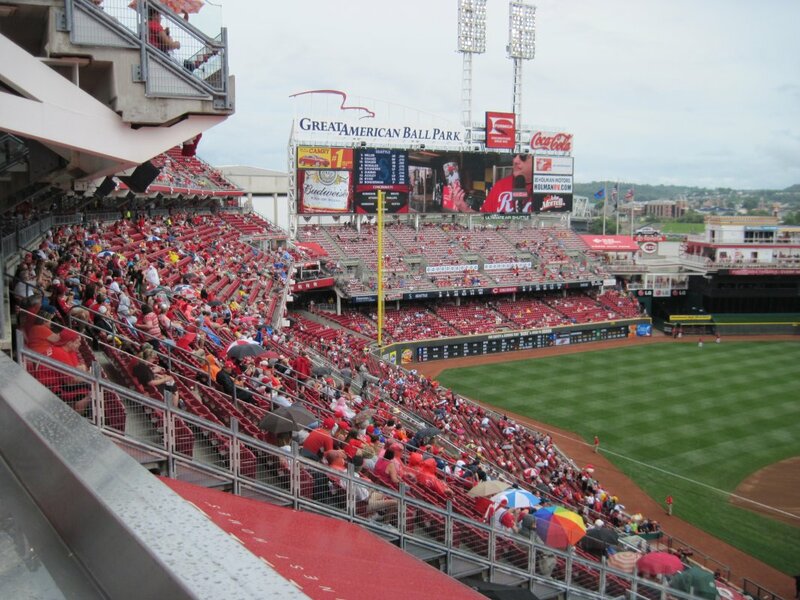 In addition to the action on the field, GABP has a few features off the field well worth checking out and making a stop in the Queen City worthy of a spot on any MLB road trip list. 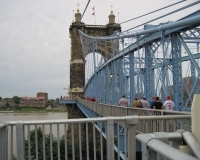 Downtown Cincinnati is, in essence, the center of what’s known as the Tri-State area — to the uninitiated, the metro region encompasses parts of Kentucky (right across the Ohio River, and the area’s airport is actually in Kentucky, not Ohio) and Indiana. 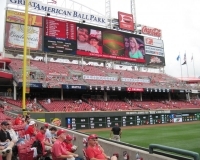 The downtown area is served by two major highways, Interstates 75 (leading south from Dayton and Toledo) and 71 (southwest from Columbus and Cleveland), which meet at a point just a few miles west of GABP before crossing into Kentucky as one. 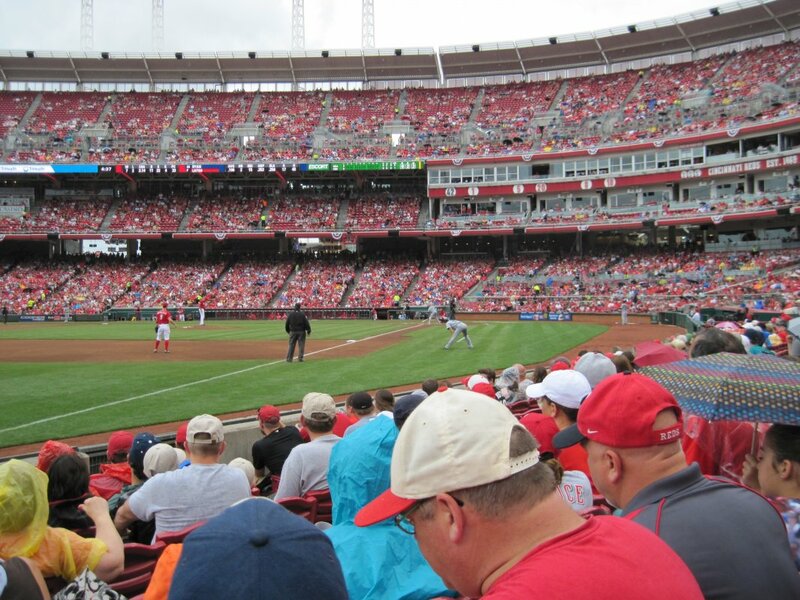 Depending on your approach, most downtown exits will get you close to the ballpark, and from there it’s a matter of navigating your way to one of the many parking structures and lots that dot the downtown area and the area surrounding GABP and neighboring Paul Brown Stadium. For detailed driving directions, click here. One neat way to find parking for GABP is through Parking Panda. This service enables drivers to find, compare, and reserve parking spaces online in advance. They have some reasonable options near GABP. A parking reservation means you can drive to the stadium knowing that a space will be waiting for you, and that you can avoid price gouging from last minute parking decisions. 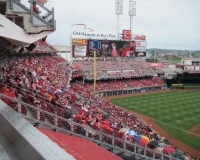 There are few appreciable public transportation options, but if you do find yourself deep in the downtown area and would rather not hoof it to the ballpark, you can use the Cincinnati Bell Connector, a streetcar that runs a circuit past different downtown points of interest such as Fountain Square, Government Square and more. The closest stop to GABP is along Second Street just west of Joe Nuxhall Way. 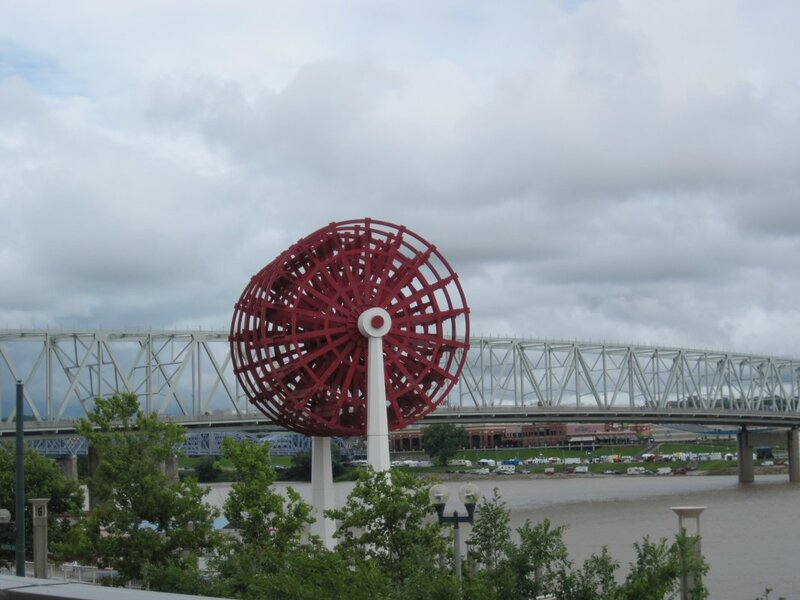 Once upon a time, the riverfront area consisted of the old Riverfront Stadium, U.S. Bank Arena (which still stands) and a handful of aging industrial buildings. 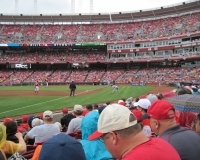 Since Great American Ball Park and the neighboring Paul Brown Stadium opened in the early 2000s, the city has done a great job redeveloping the surrounding area so that it is more of a pregame and postgame destination — and, like many districts surrounding sports venues, there are a growing number of residences nearby as well. The most popular area for pregame fun is just west of the stadium — where Riverfront Stadium once stood — which has a number of sports pub-type establishments such as Yard House and Moerlein Lager House as well as smaller, quick-bite restaurants. Also in this area is the National Underground Railroad Freedom Center. There’s plenty more to see and do farther into downtown. Fountain Square, at the corner of Fifth and Vine streets, is a common gathering area for sports fans (and for the rest of the city’s residents alike) and is surrounded by bars, fine dining and fast food places alike. And don’t discount going across the river for pregame enjoyment. 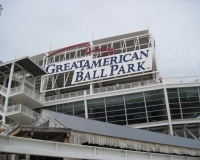 The city of Covington, Ky., has its own entertainment district and a number of brand-name hotels, most of which are a reasonable walk from the ballpark. 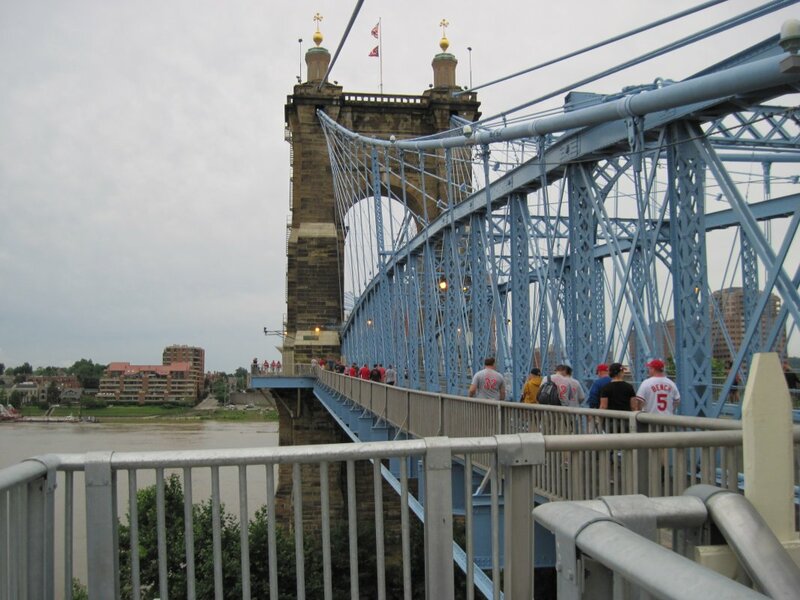 Don’t let the sight of the mighty Ohio in between fool you — all it takes is a stroll across the historic Roebling Suspension Bridge and then a right turn on Freedom Way, and you’re at the ballpark’s doorstep. A good starting point for checking out Great American Ball Park is the first-base side along Joe Nuxhall Way, where you’ll find the Reds team store and the team Hall of Fame in a standalone building. 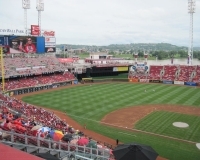 A similar building holding the Reds’ administrative offices straddles the third-base side, and the opening between the two structures helps create a rather dramatic entrance leading to the home-plate gate. It’s in this area that you’ll also find the majority of statues around the park honoring greats of the past, including Ted Kluszewski, Joe Nuxhall and Frank Robinson, as part of a sculpture garden known as Crosley Terrace — a nod to the team’s old home, Crosley Field. Greats from other eras in team history such as Johnny Bench, Joe Morgan and Tony Perez, also have statues nearby. The Reds’ most controversial past star, Pete Rose, will be joining them in 2017. 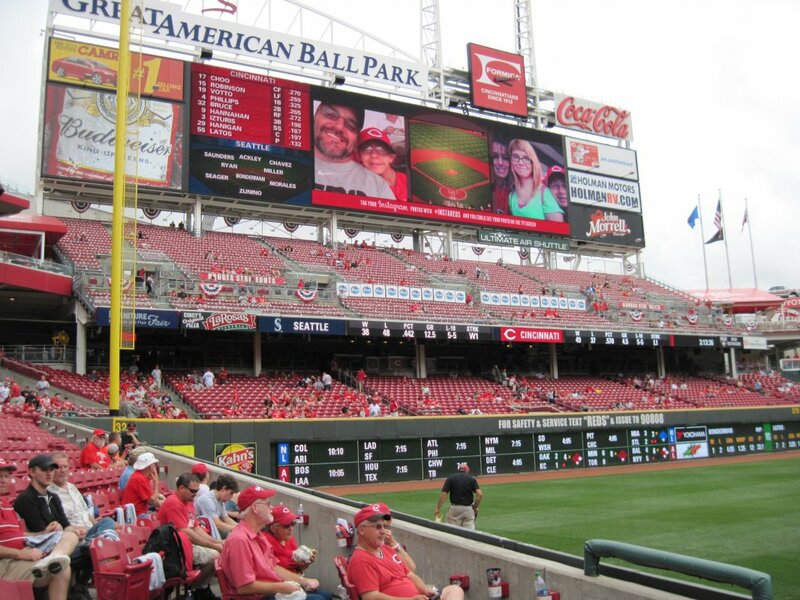 Inside, the primary view most fans will have is not of downtown Cincinnati but of the Ohio River. 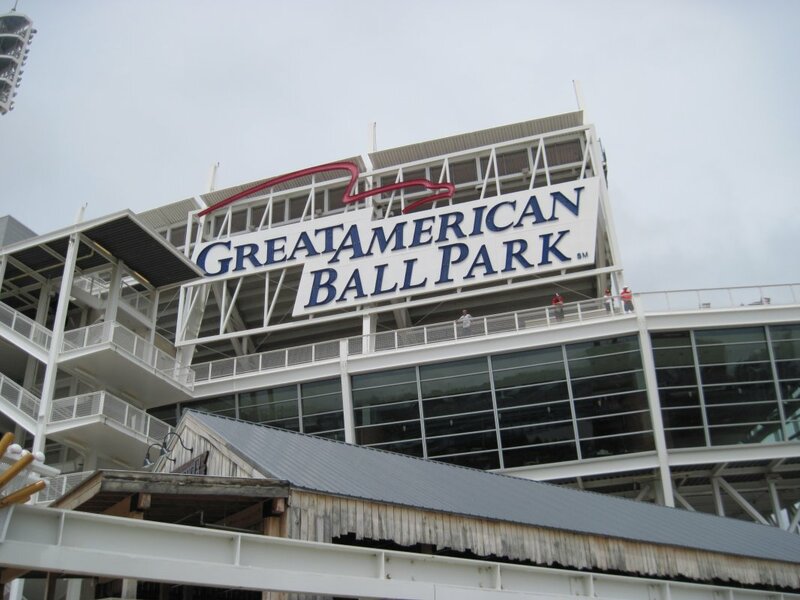 As such, a riverboat motif is prevalent in the outfield, complete with smokestacks that shoot off whenever a Reds player hits a home run or the team wins (the smokestacks once caught fire during a 2015 game). 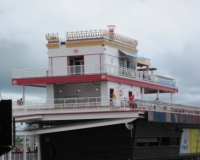 The Riverboat Deck, a party patio area, also stands above the center field batter’s eye and is fashioned to look like a riverboat cruising the Ohio. For those missing the view of the downtown skyline, a distinctive gap in the upper seating bowl along the third-base side offers that view for patrons sitting in the outfield. 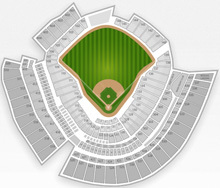 Otherwise, the seating bowl is fairly standard, with two main levels. 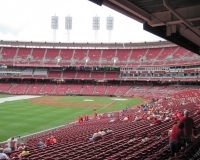 The ballpark’s relatively small footprint means the upper level is fairly steep, and that’s also the case in the left- and right-field bleachers. 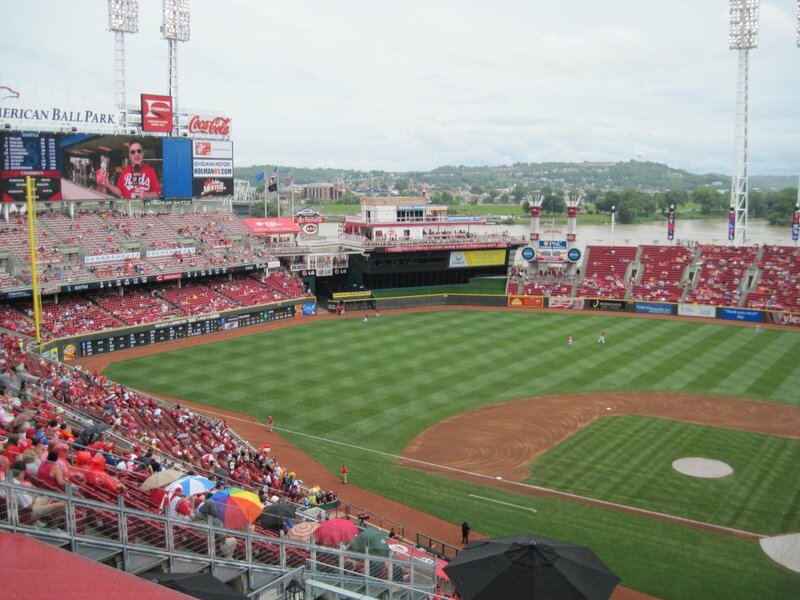 Walk around the ballpark’s concession stands and you’ll see a number of Cincinnati-area favorites, the most conspicuous being Skyline Chili, a local chain that serves Cincy-style coneys (small hot dogs loaded with chili and finely grated cheese). Also check out the Porkopolis stands for a selection of German sausages (known locally as “metts”), Frisch’s Big Boy for standards like hot dogs and chicken tenders. Local BBQ purveyor Montgomery Inn also has a presence, serving ribs and brisket. And don’t miss the handful of self-serve beer dispensers around the ballpark, introduced in 2015.